For its latest budget T series subwoofer, REL pushes the design envelope. Instead of a reflex port, or a sealed enclosure to tailor the bass, REL chooses a downwards firing main driver in conjunction with a forward facing passive unit - a drive unit with no motor assembly. Passive units (aka ABRs) work rather like reflex ports, but there is no port generated wind noise, and there are additional variables (eg the weight and compliance of the ABR cone) to help the designer tweak the sound. In this case the downwards facing, actively driven unit has a 203mm cone, and the ABR a 254m cone. Connections to the main system include REL's favoured high level input which has a Speakon connector. This connects to the main channel speaker terminals, which as a result sees exactly the same sound balance as the main speakers. 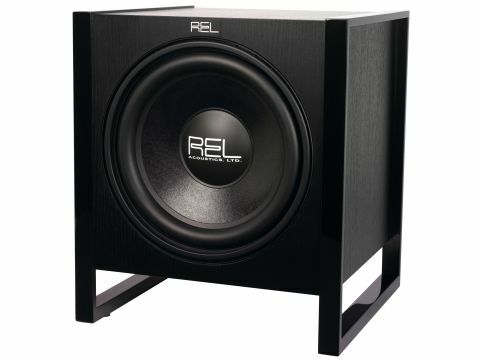 In a multichannel system, the REL can also be connected using its LFE input to reproduce the special effects and other deep bass noises on the .1 LFE channel. The two inputs act in concert and can be adjusted individually which will take about 10 minutes or so using the procedure catalogued in the well-written instructions. The square section rails at the base of the subwoofer (made of wood, not steel) support the subwoofer high enough off the ground for the bass output to reach into the listening room. A lot of care and attention went into the design of the T series, of which the T2 is the middle model of the three available, and it shows. Set up initially with the new high performance Jamo C803 stand mount speaker by REL's John Hunter, the method of tuning was to leave the satellite speakers working full range, and to bring the subwoofer up to reinforce the sound just below where the satellites gave up the ghost. Initially set a little too high, one listener thought she was hearing someone walking up the stairs of the building. Subwoofer volume and filter levels should be adjusted to just below the point where its contribution is obvious at the handover frequency. Not until this is taken care of will the sub begin to show its true mettle. The REL T2 is fast and assured, and with proper level control it sounds tuneful and it doesn't overhang, yet it extends the overall low frequency operating area of the host system to typically around 26Hz or so - which is awesomely deep for a relatively compact subwoofer. Overall system tonality is richer and fuller, and special effects, explosions and the like, are more telling. When set up as recommended, the T2 adds immeasurably to image scale and tonality, and it has enough power headroom on tap to rattle the rafters. The T2 is an unusually capable subwoofer for music and movies alike, and good value for money too.